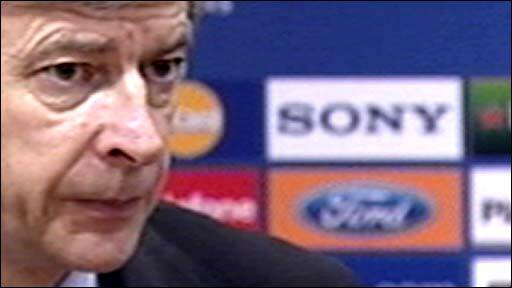 Arsenal boss Arsene Wenger blamed poor refereeing decisions for his side's Champions League exit to Liverpool. He said: "I felt the game was over at 2-2. Then there was a dodgy penalty and we started to lose concentration. "Over the two games this is hard to swallow. The big decisions over penalties have gone against us. "It is difficult to take, the players in the dressing room are very down because they believe week after week the decisions are going against them." A goal from Arsenal striker Emmanuel Adebayor with less than seven minutes remaining looked set to put them through on away goals. But when Kolo Toure clashed with Liverpool substitute Ryan Babel the Reds were awarded a penalty from which Steven Gerrard scored. "It was not a penalty," added Wenger. "I have seen the replay but we were denied a clear penalty last week. That was a real penalty, this one wasn't. "At 2-2 we had a great chance to kill the game off but we lacked experience and made big mistakes." Toure himself agreed with Wenger that the penalty decision was harsh on the Gunners. "Liverpool got a penalty which was really hard to accept," he said. "The referee gave the foul against me, but I just moved away from him [Babel] and I think Cesc caught his hand maybe, which was outside the area anyway - but that is the game and the referee has given the penalty. What can you do?" Babel insisted that the referee's award of the penalty was merited. "I am not the kind of player who likes to dive," he said. "My father taught me even if they try to pull you down with all 11 men, if you think you can score a goal, you must try. "Something happened before with Toure and Cesc [Fabregas] a little bit and, in the beginning, I tried to stay on my feet - but then it was not possible." Arsenal were the better of the two sides in the initial stages and led through an Abou Diaby strike, only for Sami Hyypia to be left free at a corner to head the equaliser on the half-hour mark. Fernando Torres made it 2-1 to Liverpool with 20 minutes remaining with a strike from inside the Arsenal area before the game exploded into life in the closing stages. Wenger was upset with his side's defending but vowed to continue their unlikely fight for the Premier League title. "We conceded a goal from a corner and gave Fernando Torres too much room when he scored," he added. "It will be hard now, we have to go to Manchester United next at the weekend, but we will try to finish strongly. But we still feel a great sense of injustice." The Gunners are six points behind leaders Manchester United with only five games remaining.